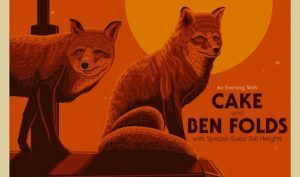 Following last year’s acclaimed tour of the eastern US with Cake, Ben Folds is teaming up with the anti-grunge heroes for a co-headlining western states tour in September 2019. Kicking off in Bonner, Montana, adjacent to the college town of Missoula, the tour plays eleven gigs in seven states, wrapping up in the Dallas, Texas area. “We had so much fun with Ben last summer that we decided to do it again, this time in the west,” said Cake frontman John McCrea. Calling them “masters and my friends,” Ben said he was happy to be on tour with the Sacramento-based band. Joining a growing trend among artists, publishers and other creators, Ben Folds has opened an account at the crowdfunding site Patreon, and will be offering enhanced content and experiences to those who become regular paying members. Launched this week, Ben’s Patreon page will offer perks like live streams from his studios, MP3s of unreleased songs, and the opportunity to contribute to songs that are written and performed on the spot. Ben Folds will be touring with the Violent Femmes this summer. The show takes the two to more than a dozen cities from the northeast to midwestern United States. Fan presale starts March 5 and ticket sales to the general public will be available March 8. Check the cities and dates here. 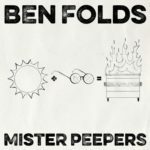 The single for Mister Peepers, Ben Folds’ song about deputy Attorney General Rod J. Rosenstein and the derogatory characterizations of him (and which we wrote about here) will be released on 7-inch vinyl in the US. There’s a release event planned at Brooklyn’s Rough Trade at 3:00 pm Saturday, November 24, which is also Small Business Saturday. Ben will give a short performance, followed by a signing of the single. You only need purchase a copy of the 7″ ($8.99) to be admitted to the event. Doors open at 2:00 pm. Rough Trade is a top independent purveyor of music and media. The Brooklyn store, in the Williamsburg neighborhood, is the largest of five locations, the other four being in the UK. The 7-inch single, backed with A Million Years, will also be available, along with other special releases, at select independent record stores around the country as part of the Record Store Day event for Small Business Saturday. Check with your local shop for availability. Those who have heard Ben’s live shows recognize his occasional foray into current political affairs. Though rare, his leanings belie his red-state upbringing while at the same time are generally in line with his audience. So, following in the footsteps of his recent performance for and alongside Tennessee Democratic Senate candidate and former Governor Phil Bredesen, Ben has recorded a song taking aim at the discord between Deputy Attorney General Rod J. Rosenstein and Ohio Republican congressman Jim Jordan that arose during a hearing in June.